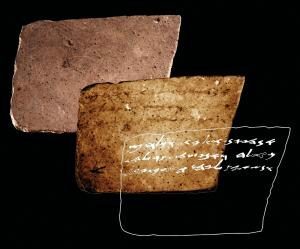 AMERICAN FRIENDS OF TEL AVIV UNIVERSITY—Using advanced imaging technology, Tel Aviv University researchers have discovered a hitherto invisible inscription on the back of a pottery shard that has been on display at The Israel Museum for more than 50 years. The ostracon (ink-inscribed pottery shard) was first found in poor condition in 1965 at the desert fortress of Arad. It dates back to ca. 600 BCE, the eve of the kingdom of Judah’s destruction by Nebuchadnezzar. The inscription on its front side, opening with a blessing by Yahweh, discusses money transfers and has been studied by archaeologists and biblical scholars alike. “While its front side has been thoroughly studied, its back was considered blank,” said Arie Shaus of TAU’s Department of Applied Mathematics, one of the principal investigators of the study published today in PLOS ONE. The study can be found at http://journals.plos.org/plosone/article?id=10.1371/journal.pone.0178400. “Using multispectral imaging to acquire a set of images, Michael Cordonsky of TAU’s School of Physics noticed several marks on the ostracon’s reverse side. To our surprise, three new lines of text were revealed,” Shaus said. The researchers were able to decipher 50 characters, comprising 17 words, on the back of the ostracon. “The content of the reverse side implies it is a continuation of the text on the front side,” said Shira Faigenbaum-Golovin of TAU’s Department of Applied Mathematics, another principal investigator of the study. The multidisciplinary research was conducted by Faigenbaum-Golovin, Shaus, and Barak Sober, all doctoral students in TAU’s Department of Applied Mathematics, and by Dr. Anat Mendel-Geberovich of TAU’s Department of Archaeology. Additional collaborators include Prof. David Levin and Prof. Eli Turkel of TAU’s Department of Applied Mathematics, Prof. Benjamin Sass of TAU’s Department of Archaeology, as well as Michael Cordonsky and Prof. Murray Moinester of TAU’s School of Physics. The research team was co-led by Prof. Eli Piasetzky of TAU’s School of Physics and Prof. Israel Finkelstein of TAU’s Department of Archaeology. “Using multispectral imaging, we were also able to significantly improve the reading of the front side, adding four ‘new’ lines,” said Sober. Receive 30 days free access to the popular new CuriosityStream lineup of documentaries on science, history, nature, and technology as a new Popular Archaeology premium subscriber.